Buy and print your own U.S. Postage and more. How would you like access to all the services of the Post Office™ 24/7 without ever leaving your desk? You can with Stamps.com. Just install the Stamps.com software on your PC and you’ll be ready to buy and print official USPS-approved postage for any amount or mail class. Send everything from postcards to packages right from your office or home. You can even add special USPS services like Certified Mail, USPS Tracking, insurance and more. Just click, print and mail. Simply log-in to Stamps.com, print your postage then drop your letters and packages into any mailbox, hand them to your postal carrier or schedule a USPS pick-up right through the software. If time is money, you’ll save a lot of both with Stamps.com. Between gas, parking and time, Stamps.com will save you a lot of money each month. Just think about the hourly wage of a person going to the Post Office. Let’s say that person makes $15 per hour and spends four hours a month on trips to the Post Office. That’s a lot of money you could save by using Stamps.com. Everything you can do at the Post Office… And a lot of things you can’t. Printing your postage and shipping labels is just the beginning. 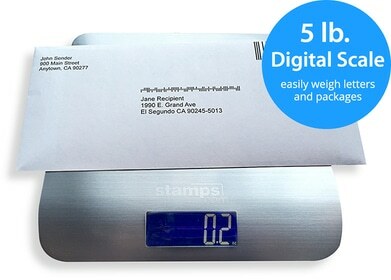 Stamps.com is a complete mailing and shipping solution. Here are just a few reasons Stamps.com beats going to the Post Office.